It’s amazing all the things you can do with a big blob of beef fat. Once you render it into tallow, soap, candles, and the best french fries you’ve ever put in your mouth all become very real possibilities. I’ve been threatening to share a tallow soap recipe for a while now, and the day has finally arrived, my friends. 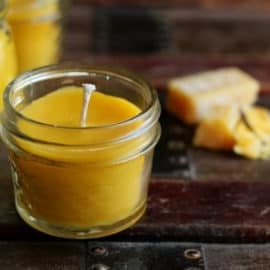 Tallow has had a bad reputation for years, which is rather silly, because it’s an excellent choice for soap making. It’s mild for the skin, produces a gentle lather, and makes a very hard bar that won’t turn into goop in your shower. But the real reason I’m drawn to it for soap making, is because lard and tallow make the most sense for homesteaders. I’m often drawn to the “gourmet” soap recipes I see on Pinterest with their elegant swirls of color and fancy flavors. But when I click on the recipe, I usually end up skipping right over it because it calls for a bazillion different types of (expensive) oils I don’t have and really don’t feel like ordering. Lard (rendered fat from pigs) and tallow (rendered fat from cattle) were the traditional fats for our homesteading ancestors because they were plentiful and cheap. Because we raise and butcher our own hogs and steers for meat, we also tend to have a bounty of pig fat and beef fat. It only makes sense to put it to good use, otherwise, it’d just go in the trash. What a waste. Most tallow soap recipes you see include a bit of tallow with a handful of vegetable oils as well. Because tallow lacks a bit of cleaning power on its own, so it’s often combined with other oils. However, the purist in me insisted on creating a 100% tallow bar, just like my homesteader ancestors would have used. I’ve also included a tallow/coconut oil recipe, just in case you’re looking for the benefits of tallow in a slightly more modern bar. If you raise your own pork and beef, the easiest, most logical source of tallow or lard is the animals you butcher. If you butcher yourself, the very best fat for soap and food recipes is the leaf fat found around the kidneys. Once you remove the kidneys from the inside, follow these directions for rendering the fat to remove the impurities. This will leave you with luscious, limitless tallow or lard. You can use the fat from other parts of the animal, but it may produce an end result with a slightly more “beefy” scent/flavor. If you get your meat from a butcher shop, ask them to save leaf fat for you. They are usually happy to give it to you or sell it for a minimal fee, as it’s not exactly a hot commodity at the moment. Yes, you have to use lye when you make soap. Otherwise, you’d be washing yourself with a giant blob of fat, which wouldn’t work well, for obvious reasons. Lye provides the necessary chemical reaction to turn fat into soap. This is a hot process soap recipe that uses a crockpot. If you’ve never made crockpot soap, please carefully read this post FIRST, it contains very important safety information. Lye doesn’t have to be scary, but you do need to be respectful of it. ALWAYS wear protective eye gear, gloves, and long sleeves when working lye, and handle it in a well-ventilated area. If you want to use a different amount of tallow, or have a smaller/larger mold, that’s an easy fix. Just run your fat amounts through a soap calculator first (like this one) to make sure you are using a proper amount of lye. Melt the tallow in the crockpot (or a pot over the stove if you’re in a hurry). Once the fat is nearly all melted, put on your safety gear and carefully measure the lye. In an area with good ventilation (I do this under with my oven fan on), carefully stir the lye into the measured water. ALWAYS add the lye to the water– do NOT add the water to the lye, as it can result in a volcano-like reaction. Stir this lye/water mixture until it has dissolved and let it sit for a few minutes. There will be a chemical reaction between the lye and water, and the water will become very hot, so be careful handling the container. Place the melted tallow in the crockpot (if it’s not already there), and slowly stir the lye/water mixture in. Switch to an immersion blender (trust me, unless you want to stand there stirring for an hour, you’ll use an immersion blender), and proceed to blend the tallow, lye, and water until you reach trace. Trace can take anywhere from 3 to 10ish minutes to achieve. Now put the lid on the crockpot, set it on LOW, and allow it to cook for 45-60 minutes. It will bubble and froth, which is fine. Just keep an eye on it to make sure it doesn’t attempt to bubble out of the pot. If it attempts an escape, just stir it back down. Once it has cooked for a while and passes the “zap” test (see this post to understand what the zap test is), pour/scoop it into a mold and allow it to set for 12-24 hours. 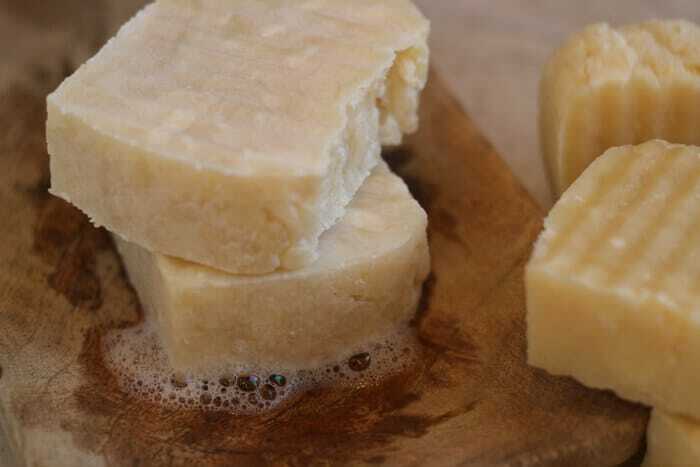 Remove the solid soap from the bar, cut into bars, and allow to cure for 1-2 weeks. You can technically use the soap right away, but the dry time will produce a nicer, harder bar of soap. Follow the above directions for pure tallow soap, melting the coconut oil in with the tallow in the first step. Why distilled water? Tap water can contain a variety of minerals which may cause weird results in the final soap. It’s best to remove this variable by simply using distilled water. 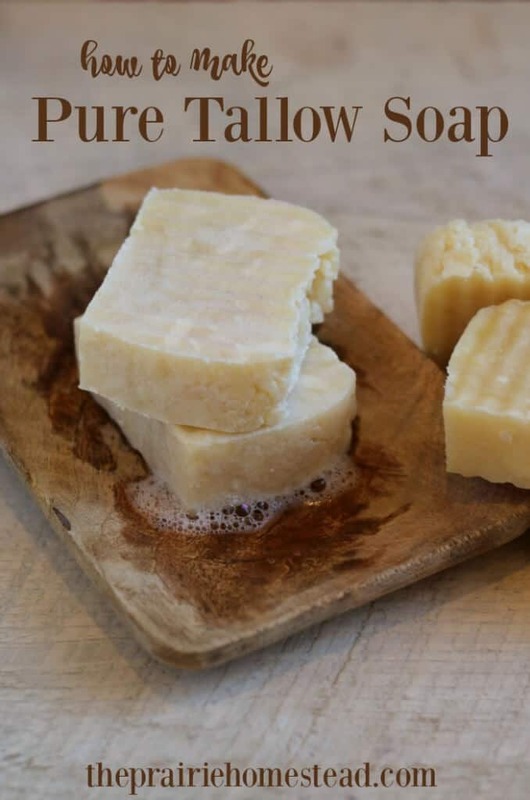 The pure tallow soap is 8% superfat, and the tallow/coconut oil soap is 6% superfat. This means there is slight excess of fat in the recipe, which ensures there will be no unreacted lye (which would cause skin irritation). This is the soap mold I’ve been using. It’s cheap and perfect for smaller batches. This is where I get my coconut oil. I buy it in 5 gallons buckets and it lasts FOREVER. Does it smell weird? My tallow soap has a bit of a “fatty” smell, but it’s not offensive (at least to me). And it does NOT smell like rendering tallow, which is good, because that’s an icky smell. Can you add essential oils to this soap? Yes, you can. If you do, add it at the very end right before you place it into the mold. However, like I’ve mentioned in the past, it takes a LOT of essential oil to make soap smell strong. 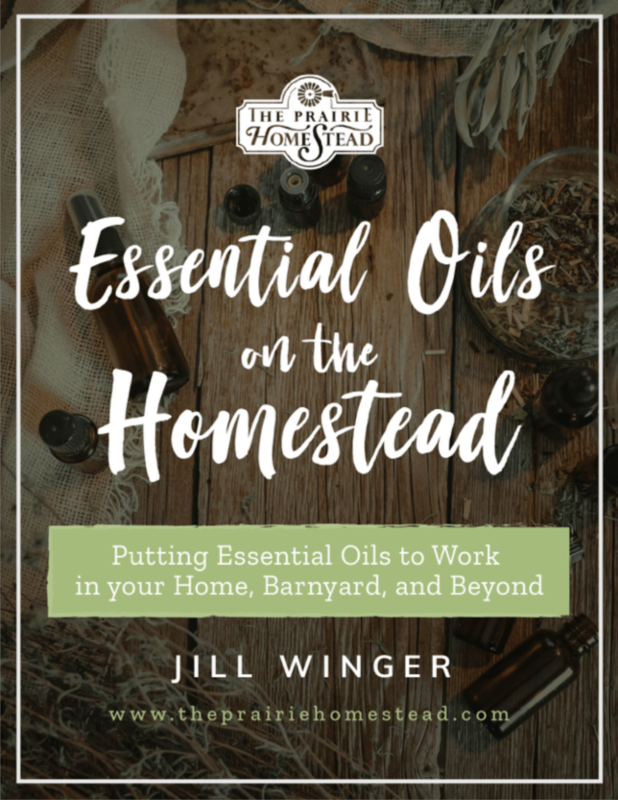 If you’re using high-quality essential oils like I do, this usually isn’t an option as it makes your homemade soap pretty costly, pretty quick. Therefore, I tend to leave my soap unscented. Or you can just purchase fragrance oils designed for soaping. If you’re looking for a scented bar with a little more pizazz, check out my homemade pumpkin soap recipe. You could still play with colors and swirls, if you wanted to, without all those fancy oils… 🙂 But then it would be better to use cold process, not hot process as above. I love soap making and do pretty much every time different look to my bars! And I leave the soap unscented as well, not worth the money, and I refuse to use artificial fragrance oils. Can’t wait to get my own little homestead and make my own tallow/lard! 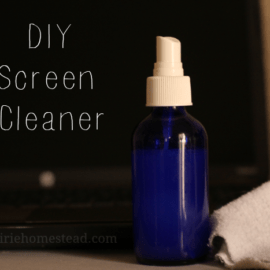 How do you safely clean up after making lye soap? I carefully rinse everything that’s come in contact with the lye, and wash with hot, soapy water before running through dishwasher. Hey, I’ve been soaping a while now & love your soap advice!! U seem so homey and down to earth!! I just wanted to say thanks for all your tips !! By the way my daughter loves pumpkin pie and she only loves Fresh Pumpkin! The one in the can is awful! I usually try to get fresh and freeze it for all year round!! Guys out there , if yall haven’t tried it , please do, it is awesome !! U will never go back to canned! Like Jill can tell you it is sooo Tasty!! I grew up canning and cooking from scratch and your advice on soaping is GREAT!!! Thanks again!! This may seem silly but if you use your immersion blender and crockpot will it be able to be used for cooking again? Once anything is used for soap making, it is recommended to only use it for soap making and not food. I have a dedicated soap crockpot (it was cheap at a yardsale). But since this recipe allows all the lye to be completely reacted, I don’t see anything wrong if you wanted to use a food crockpot. I do use just one immersion blender for food and soap. I run it through the dishwasher after I use it for soap, though. As somebody who loves to save everything, Id love to try this pevipe. Im a luttle nervous about that special ingrefientsvcalled lye. I often save rendered fats for cooking but somebody told me ypu shouldnt cook with beef fat because it might not taste good. I often use bacon fat in:plsve of butter for eggs. But this recipe seems like a good use of fst. And ehile I might not be ables to get rnough fat for pure beef soup, as I do not raise cows, tge fovonut one seems good. Im just a luttle intimidsted by the lye. Though:I might get over that and make the soap. Excuse my poor typing. Im using a touch screen. But I do love natural soaps. Iv used sheeps milk soaps from farmers markets and its helped myy itchy skin. But its quite pricey, so it woulf be nice to make beef sosp. Im guessing the lye is whats in soap that burms ourveyes? By superfatting the recipe, there will be no lye left & a tiny ant of oils/fats left. The new chemical created by combining the lye molecules w/ the oil molecules is soap. Soap burns the eyes. I grew a lot of loofas. They are not dense enough to use as a scrubber so, can I crumble them finely and add to the soap for scrubbing agent? Barbara, I use the softer loofa’s by putting them in a round mold and pouring soap over them, then after setting it’s easy to cut into bars. My husband made large, round molds for me from PVC pipe that he cut in half and put hinges on one side. I put stiff cardboard on the ends, cover one side with wax or parchment paper. i SO want to save this for when i have my own pigs. I tried to connect to your weekly email blog update piece, through fb and then through your blog… failed. Maybe it’s the link… either way – I’d love to see the evaluation on my piece of urban homestead that will be our garden come spring time. 🙂 I’ve got a little bit before I start to plant – we live in Michigan! I might even consider a few chickens – eventually! Hi Sarah– sorry you are having problems! Can you explain a bit more what you cannot access? I’m not understanding entirely. Thanks! Thanks, once again! , for a recipe I can’t wait to try! And now, seeing this post of yours, I’m going to make this soap! I’ve tried a couple tallow soap recipes, didn’t like them, but I trust yours! I’ve read that lye is made from wood ash. Have you learned how to make it and use it in different ways besides soap? 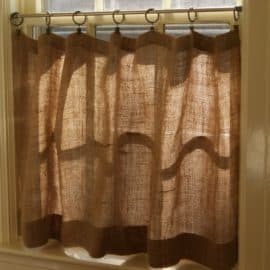 I haven’t experimented with homemade lye yet. With wood ash lye, there can be different variables which may affect the outcome of the soap, so I prefer to stick with store-bough lye for the best end product. However, I may play around with it in the future. Comment saved in my files from Kevin Dunn, who wrote the book Scientific Soapmaking, and uses soapmaking to teach chemistry to his college students. The active ingredient in wood ashes is potassium carbonate. If you burn sea plants, you get sodium carbonate. Yes, you can make soap with either of these, but for a hard bar soap, you want sodium hydroxide [lye]. The traditional way to get the hydroxide is to react wood ashes with lime (calcium hydroxide). My book, Caveman Chemistry documents the history of the alkali industry, and has several projects on making alkali from ashes and lime. Reacting wood ash with calcium hydroxide produces potassium hydroxide. To get sodium soap from potassium hydroxide, you add salt once the cook is done. Sodium soaps are less soluble than potassium soaps, so they float to the top, where you can skim them off. Making soap from wood ashes is a challenging, but rewarding project. It is part of the “Level 3 (master)” certification for the HSCG [Handcrafted Soap and Cosmetics Guild]. 1000 pounds of wood leaves about 5 pounds of ash, from which about 1 pound of potash (potassium carbonate) can be extracted. Since I make my collidial silver with distilled water could I use the collidial silver water in the soap recipe? The reason I am asking is I love my colloidal soap for my face so I was just wondering if I could use this in my recipe. Thank you, all I have is the organic coconut oil so I will have to wait until I find the other. I don’t have any experience with colloidal silver, so not sure how that’d work. Sorry! Really enjoy your humor, Jill and all your recipes and hints! Thanks so very much!! I was always told to use an enamel container when adding lye to water. We used to use an old enamel coffee pot. Was told never to use aluminum. No mention of the type of pot you used. 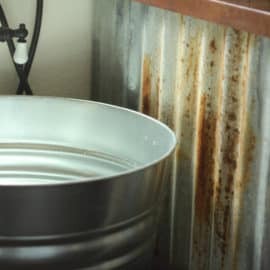 Do you find it is OK to use metal when adding lye to water, or what do you recommend? Ive always used glass measuring cups or bowls to mix the lye and water as it can cause a reaction with metal. I believe that is what Jill uses as well! I’ve always just used glass or pyrex. #5 plastic containers work great. Glass can etch from the lye over time and get hairline fractures that you can’t see, and eventually shatter – at the worst possible moments. I use plastic or stainless. You can pick up plastic tubs from restaurants for free a lot of times. I have been wanting to make bar soap but am trying to find something that doesn’t dry my skin out a ton. Do you find the tallow helps it stay moisturized or is it pretty standard soap? Hope that makes sense! Thanks! It seems to be pretty standard to me. Not ultra moisturizing necessarily, but not drying, either. This is perfect for selling in our roadside stand next fall. Now I just have to remember to ask to the butcher to save the leaf fat… Thanks Jill! I just have a regular cheapo crockpot I got at a yardsale. It has a coated finish and works just fine. Do you think I could substitute the 9oz distilled water for 9 oz of fresh moringa juice? I have never made moringa soap because the moringa soap recipes that I have found call for the “fancy” butters and oils. I have all of the ingredients and hardware to make the Coconut Tallow recipe. I also just topped off and trimmed my moringa tree and I have a lot more leaves than I can use for food. This will be my first soap batch, so I thought I would ask first. Thank you for any input. I don’t know anything about mooring juice, but it’s worth a try! I have 2 questions. First, I only have access to lard at this time. 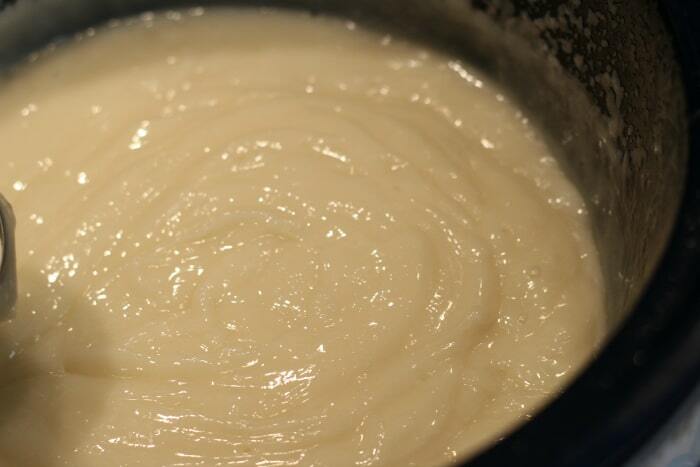 Do you happen to know what the different properties between lard and tallow are? Also, I received a free bottle of fractionated coconut oil and am wondering if I can use that in this recipe. If I use these ingredients do I need to check the lye calculator or will the amount you listed work? Thank you! Yes, you can definitely substitute in lard instead. However, if you want to use FCO, you’ll definitely need to run it all through the calculator. Fractionated coconut isn’t really worth using in soap. It’s coconut stripped of most of its components. Very light. Nice as a carrier oil when diluting essential oils. But for coconut in soap, just go to the store and buy a jar. Can Crisco be used instead of tallow? I imagine you could make soap with Crisco, but I’ve never tried it personally. Hi Jill, I JUST NOW received my shipment of tallow and I am so excited to try you recipe! I am wondering however, if you could use milk in place of the water, while keeping the tallow and now adding any other oils or fats. We are hoping to have our own milk animal one day (cow or goat-not sure yet) so I am trying to find things to use the excess milk for. Thanks for your help and time, love your blog, good luck on all your future endeavors! Oops, *use milk in place of the water while also using the tallow and NOT adding any other fats or oils. I see that the process above states “When making soap, always measure by WEIGHT, not by volume”. Does this mean to measure ALL ingredients by weight, including the tallow, lye, distilled water, and coconut oil. I’ve never known of a recipe to call for measuring water by weight, and I generally take things literally, so I’d like to get this chemistry experiment right if I decide to tackle it. Yes, measure everything by weight, including the water. So this is the first time I’ve made soap. I’d been wanting to make soap for a long long time but thought it would be difficult… how wrong could I be! I followed your recipe exactly but made a half portion. And the result: Oh WOW it’s incredible!! Rich and lathery and doesn’t smell of tallow at all… I love it! Thank you so much for posting this… I’ll never have to buy another chemical laden bar of soap again. Came across your website a few weeks ago and love it. Thank you for all that you share! Have you ever used bear fat? I’ve rendered down the fat but can not find a recipe for bear fat! ? I haven’t, but I’m betting it’d work almost the same as lard. Bear fat is most similar to olive oil. I’ve soaped it (as one of several oils in a recipe). Its very stinky to render, and super soft, even when frozen. Substitute it for olive or another soft oil in your recipe. Not really a substitute for lard/tallow. I am so happy to see a recipe with lard and or tallow. It seems that animal fats are not getting the recognition they deserve. I bought lard recently to make a more economic bar, and loved it so much more than my coconut/ and other expensive oils. I will never go back. Too much coconut oil produces an irritating bar for my sensitive skin. But when I switched to lard the bar was smooth and left my skin feeling great. I also use goat milk in my recipe instead of water. I really enjoyed your post, thank you for putting it out there! How much does this recipie for the Tallow Coconut Oil soap yeald? Looking to make a large batch to last! Jo here from Queensland in Australia. Love your recipe but just one small question. In the start, you say “melt your tallow in crockpot ” how do you melt it, just on its own or do you ad water and cook it for a while and then skim off the fat? 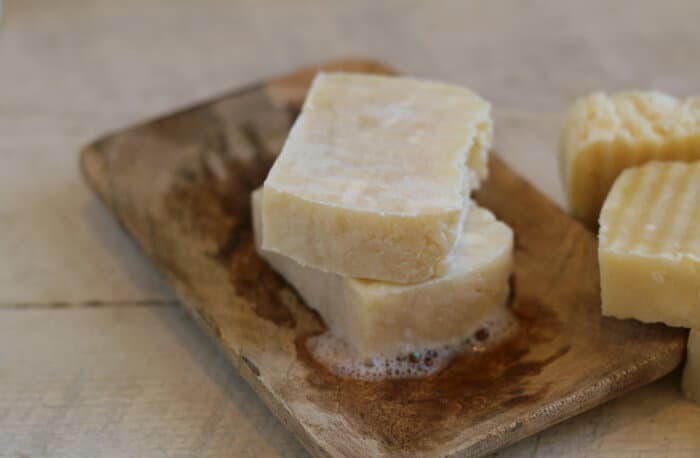 Just not sure about that step but the rest…..awesome and I can’t wait to try this after making soap with all sorts of oils but as pointed out, it makes a rather expensive soap as I also added EOs..
Hi Jo– for this recipe, you are using finished tallow, so you do not want to add water. If you are starting with raw beef fat, you need to render it before you can make this soap. THere’s a tallow rendering tutorial here on the blog as well. Does it have to be 100% lye? I see a lot of 98.5% lye. Didn’t have time to read through the comment….can you double this recipe? Thanks! When I run this recipe through SoapCalc, it shows it to be about an 18% superfat. You indicate 8%. Any chance this is a typo from when you ran it through a lye calculator? I show 4.42 oz lye for the 33 oz tallow. New to soap making. I have clean, home-rendered tallow, lard, and coconut oil. I also have a lot of fruit. My question: I’m hoping to use dehydrated, orange peel powder in the soap. Any experience with fruit powders? I would love to here if you like the results or not. Thank you four any help and/or advice. I think the powders could be used as either colorants or abrasiveness or both. I have a goats milk soap recipe that uses lemon peel… I haven’t made it but I know it doesn’t affect the chemistry of the soap at all. Hope this helps or gets the ball rollin’ for you. Why is there more lye and less water in the coconut oil soap recipe? Does the pure tallow recipe require more water for some reason? I know you are superfatting the tallow more, so it would make sense to have less lye… but why more water? Thanks a lot. Just seeing if you know. I’m about to embark on soapmaking! Partly because I have several liters of an unusual flavor of EVOO that I’ll never use before it goes rancid. I never understood why homemade soaps at fairs and such was so expensive until I started looking at essential oils. Sheesh! Here’s my question: I know about “fragrance oils” which are much cheaper and are typically artificial. But what about (don’t know that it’s called, infused? ; lots of terminology to learn!) where you take actual flowers (like lilac or lavender) and put a ton in a jar and cover with oil. The recipes I’ve seen, the flowers get swapped out for fresh ones at some point and its left to steep for at least a week, some say several weeks. It’s supposed to be very strong. Anybody used those? And what about culinary extracts like peppermint and vanilla? At my job we use lye (caustic chemical) to clean out industrial sized walk in ovens. All we do is put diluted caustic in it and steam it…..then rinse with lots of water. No soap…..no vinegar. These are not bad ideas but usually not needed. After we rinse we dry and if no white spots (caustic residue) after the dry step we are fine. Safe to use. My company is a large company that makes products I bet many of you have eaten and been perfectly fine. As long as you rinse it your fine if the pot looks good. It what I do….do what you want at your own risk. Just my thoughts. To sent the soaps, when making the tallow, could you add your own mixture of fresh herbs? What size mould do you use, and how did you get these nice fluted sides? I am hoping you can help me . The two CP batches of soap that i made from the same rendered suet have developed DOS. None of my other batches have developed DOS . All my batches are pure tallow and no other ingredients at all. Have you ever had any DOS on your tallow soaps? I must admit that i left the rendered tallow in a plastic bucket in my pantry as i had read that tallow is shelf stable for up to a year so do you think this may be the problem and if so, will all my other soaps develop DOS soon? Willing to try HP if needed but from what i can find out, it happens to HP as well. Please can you offer any advice on 100% tallow soap? Hi Jo– I’m sorry you’re having problems! I’ve never had that issue with my tallow soaps, so I’m not sure what would be causing that. Perhaps it turned rancid in the pantry? I’m sorry not to be more help. Thanks so much for replying. I am hoping other readers may offer some help as well. From what I can tell, no one really knows what causes DOS but I am sure, keeping the tallow in the pantry did not help, as you pointed out. Just found your site and can’t wait to give some of this a try. I am already hooked up with the Leaf fat. Got another question in regards to the Lye, back in the day were/how did they get/make there Lye? Probably not going to try and do/make it but just wondering. Hi there, I am at a loss. I am hoping you can shed some light on this recent issue of mine. A local butcher asked me to make soap out of the tallow he has. At first, the soap recipe was a dream to work with, so creamy and amazing! Then came a new batch of tallow and all the problems came with it. Who knows WTH is going on, certainly NOT me. Same recipe, same scale (tested), same lye, but certainly not the same results. My oils practically seize up upon adding the lye, immersion blender could not. I soaped cool, I soaped warm, same reaction, mashed potatoes almost instantly! I just got another batch of tallow, same damn thing! I tried taking the tallow percentage down to 50% from 75%, still lumpy and practically worthless. I had two failed batches where I could not mix the lye in enough and ended up with my first lye pockets. I am dumbfounded. Do you have any idea what could possibly be happening? Some ladies over at the soap making forum said my stearic is too high but that doesn’t make sense if I had the tallow at 75% before and you are making 100%. I just do not get it! Thank you for your time! 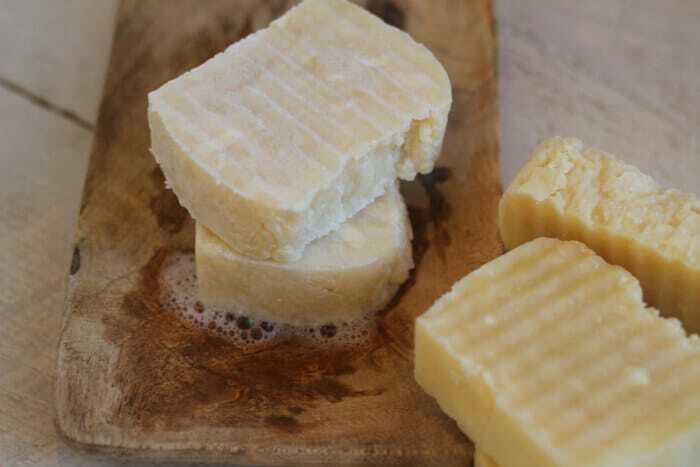 HI I loved having your guide to making tallow soap! It worked great! I am concerned though, if it is safe to use because my stick blender bottom, reacted to the lye and turned black, and now the metal rubs off on touch, is it safe now to use the soap? I’m worried that some of the metal gets in the soap in mixing process? And if it is safe to use the soap that was mixed with it when it reacted? Thanks for your help! Bless you! Would using a leaf lard/ghee mix have any affect on the outcome of the recipe? If I do not have an immersion blender, would a hand-held mixer do the job alright?